My spirit animal of spirits, Sku at RecentEats, has recently been "loooosing his religion"--e.g., struggling to find whiskeys worth reviewing. And, like him (nay, because of him), these days I'm more interested in Armagnac and cask-strength Cognac/rum, but in Texas, there just isn't much to go around and getting bottles shipped here is a hassle because of onerous state/federal regulations from bureaucrats working to preserve retailer oligopolies. But I digress. Uh oh: it's got a generic high-rye bourbon smell, like burnt pepper and minty toilet cleaner. We might call that a "soapy nose." Nothing bad, just reminds me of generic Buffalo Trace juice, though obv. this is from the dreaded Brown-Forman. Without water it's...eh. Pretty hot, a bit too sweet upfront, the rye notes are disjointed, and there's a bitter/burnt plastic note on the finish that's unpleasant. Again, not horrible, but blind, I'd guess it was the loathsome Stagg Jr.. By the way, how can Stagg Jr. be so vile but Blanton's Straight From the Barrel is usually so delightful? Side issue. Ok, so let's add a few drops of water, as Sku suggested. Of course, I'm using reverse-osmosis filtered water, which you can buy for 39 cents/gallon at the grocery store. Reverse-osmosis removes the toxic fluoride, pesticides, chlorine and trace pharmaceuticals in the municipal tap water. Plus, it's better for the whisky. It brings out some of the fruitier notes (prunes?) and tames the bitterness a bit, but I'm still unimpressed. 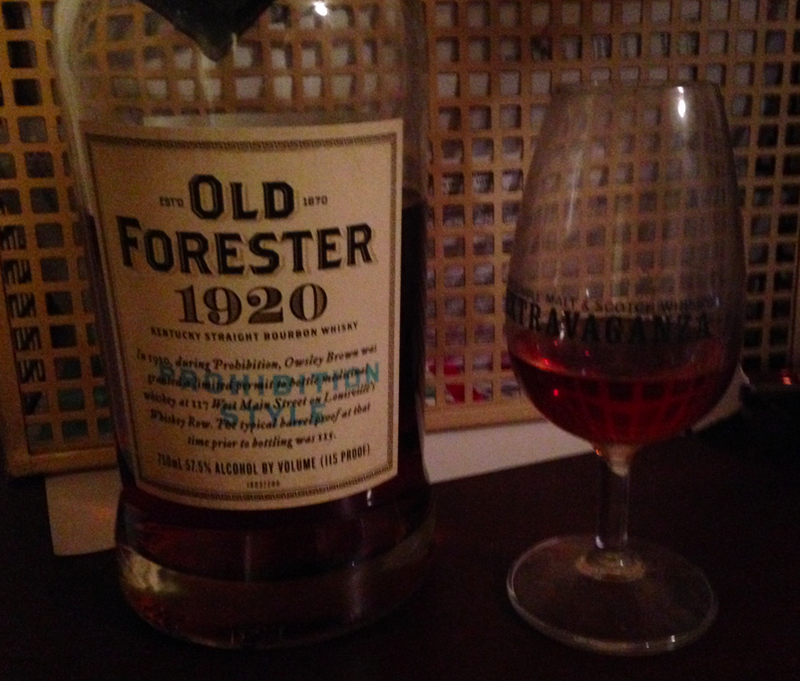 Again, it's passable and borderline-decent, but I'd much rather drink Henry McKenna BIB for less than half the price, or even Evan Williams Bottled-in-Bond for $13. Or Four Roses Single Barrel, or Wild Turkey Russell's Reserve Single Barrel. Or...well, you get the damned idea. I got this on super-sale for $45, but even at that price, I can't recommend it. I usually detest Brown-Forman whiskeys and this one joins the club. Without water: 74 points/C. Blech. With water: 78 pts/C+. The only reason that the bottle is so depleted is that I gave a bunch to friends with lesser palates.